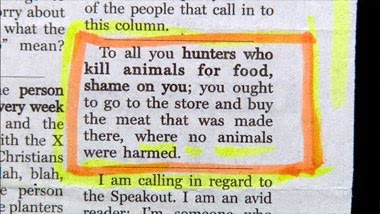 The idea of buying meat at the grocery store where "no animals are harmed" sounds completely ignorant, doesn't it? According to MSNBC and LiveScience.com, scientists are working on developing real meat that will be grown in vats without ever actually being part of a living animal. Bioengineers have already figured out how to grow "tiny nuggets" of meat from living cells without any actual livestock being effected. Some suggest that someday, we will have animal-less steak, pork, chicken and designer meats (like seal, whale, dolphin, monkey or even human) that taste and nourish just like the real thing-- without having any farms or ranches. --cut down on food-borne ailments, like swine flu. The capability to do this is within sight. However, biomedical engineer Mark Post said, "Of course, we still have a long way to go to make a product that is even remotely competitive with current products."